Early in the Athenaeum’s history, proprietors and sea captains contributed “curiosities” to the small museum, which the Athenaeum maintained on the fourth floor of this building. Many of these curiosities were in the realm of natural history, but unusual objects picked up in travels around the world also joined the collection. Travelers were interested in folk costumes, and shoes unlike those they saw at home were collected and donated to the Athenaeum. Those exhibited here were all given to the small museum in the 1820s. Given by Rev. Charles Burroughs. Although the place name was interpreted later as Hawaii, it may refer to Ouche in Normandy. 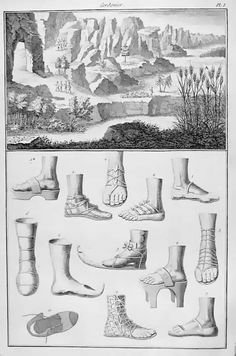 Denis Diderot’s Encyclopaedie of 1762 shows all the major crafts and industries of France, among them the art of making leather shoes and sabots, or wooden shoes.